September 17th marked an historic day for river restoration. The project to remove two dams blocking the Elwha River in Washington began on September 17th in what the New York Times has called “One of the most promising and pure acts of environmental restoration the region and nation have ever seen.” When the removals are complete, both the Elwha and the White Salmon rivers will be free flowing for the first time in a century. Built in the early 1900’s, before the establishment of Olympic National Park, the two hydroelectric dams on the Elwha River have been barriers to salmon and other fish populations as well as whitewater recreation for nearly a century. Once removed whitewater enthusiasts will be able to enjoy a free-flowing river from the wilderness backcountry of the Grand Canyon of the Elwha all the way to the Juan De Fuca Strait near Port Angeles, Washington. The lower, 108’ tall Elwha Dam covered an area of river with an estimated 38’/mile gradient while the upper Glines Canyon Dam, sitting at 210 feet, covered a section of the Elwha River with an estimated 90’/mile gradient. These newly resurrected sections of the Elwha River will provide whitewater enthusiasts with new and exciting whitewater opportunities. Along with providing river enthusiasts new sources of enjoyment, the Lower Elwha Klallam Tribe is anticipating a cultural renewal. 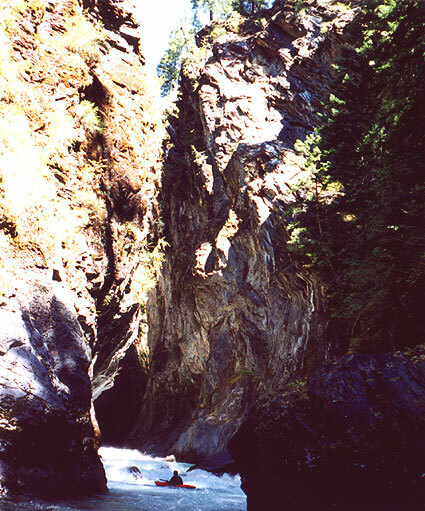 The Lower Elwha Klallam Tribe has resided in the Lower Elwha River Valley since time immemorial. Their tribal lands include about a thousand acres of land on and near the Elwha River. With the removal of the dams on the Elwha River the Lower Elwha Klallam Tribe will be reunited with sacred grounds that have been inundated for over a century. Stories from the Lower Elwha Klallam Tribe tell of a time when the numbers of salmon in the Elwha were so great that one could walk across the river on the backs of the fish. Today, because the dams were built without any way for the fish to reach the breading and spawning grounds up stream, the fish population has dwindled to an estimated 3000 fish. With access to high quality habitat restored, salmon populations are anticipated to grow to as many as 400,000. American Whitewater and its members are looking forward to the return of these stunningly beautiful stretches of wild rivers. American Whitewater has actively supported this restoration effort for the past two decades. While the dams were important in the economic development of the Olympic Peninsula, they produce a very small amount of energy relative to their environmental impact. In 1992 the Elwha River Restoration Act was passed and authorized the Secretary of Interior to acquire and remove the two dams and restore the ecosystem and native fisheries. For more information and to follow the progress of this historic river restoration project visit the following sites. Previous articlePL Canoe Schwag Review!